It has become commonplace to hear political talk at Hollywood events. Celebrities hold a considerable amount of influence in the media; they are often in the spotlight and are not afraid to speak out for what they believe. It is also predictable that Stephen Colbert, an avid critic of President Trump, took his opportunity as host of the 2017 Emmys to lash out and rant about the current administration. The Emmys, described by Colbert as “one of TV’s highest honors; us celebrating us,” provided a big stage with bright lights where eccentric personalities and opinions were expected. 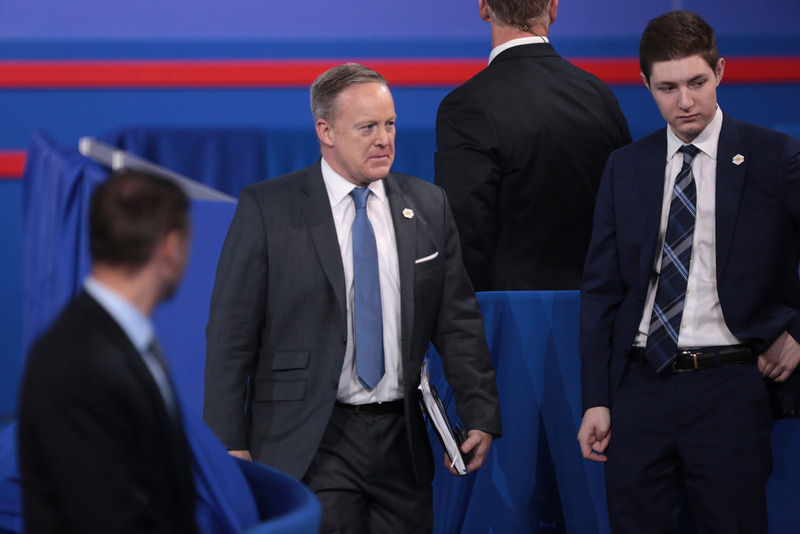 However, a surprise appearance from former White House Press Secretary Sean Spicer was not. “This will be the largest audience to witness the Emmys, period – both in person and around the world,” Spicer said from the podium, making satirical reference to his first encounter with the press when speaking about the presidential inauguration audience. Spicer’s first press conference confronted allegations that Trump’s presidential inauguration had been smaller President Barack Obama’s in 2012. Back in January, Spicer famously said, “This was the largest audience to ever witness an inauguration, period,” while many pictures disproving that claim circulated online and in newsrooms nationwide. Colbert also mentioned Melissa McCarthy, who won a creative Emmy for her interpretation of Sean Spicer on Saturday Night Live. The cameramen made it a point to capture her reaction, as well as the reaction of many of the other attendees. Among those who deemed Spicer’s cameo inappropriate was President Trump, who jumped on Twitter to lash out at the Emmys. “I was saddened to see how bad the ratings were on the Emmys last night – the worst ever. Smartest people of them all are the ‘DEPLORABLES,’” he tweeted. Colbert did not take long to respond sarcastically. President Trump’s tweet was exactly what Colbert was going after with the skit: a reaction, which, as evidenced by recent shots at Stephen Curry and Kim Jong-Un, is not that hard to achieve anyway. There is no doubt that the whole cameo was for the ratings, which increased dramatically after Spicer’s appearance. In reality, while the purpose was to mock him, Spicer was the real winner. His appearance at the Emmys will increase his value even more than it already has this year. After a year of being constantly criticized as press secretary, this stage was the perfect opportunity for Spicer to rebrand. Some say that all publicity is good publicity. After Spicer left the White House, he started getting requests to give speeches about his time working with the President. He received a reality show offer (which he declined) and Harvard invited him to be a visiting fellow. Spicer wants to be forgiven by the American people and hopes to stand side by side with the people who mocked him on national TV. Their approval is his validation. He even said he “regrets berating on reporters” during the presidential inauguration press conference. After this Emmy’s appearance, people think he is funny and relatable, and want a picture with him. Spicer is a celebrity now, which is exactly what he was going after.